I used to work with a guy I called Hatman. I called him Hatman because he owns hundreds of different hats. After reading his 20th tweet about collecting sneakers, I had to ask him why anyone would want to own more than one pair or running shoes. Sure, I could see a guy wanting to own two or three maybe, but Hatman has dozens and dozens of pairs of very expensive sneakers. I just didn't get it. Hatman introduced me to his buddy Ryan Aleong who took the time to write a guest blog entry about why he loves collecting sneakers. He calls this "The Phenomenon of Sneaker Culture". 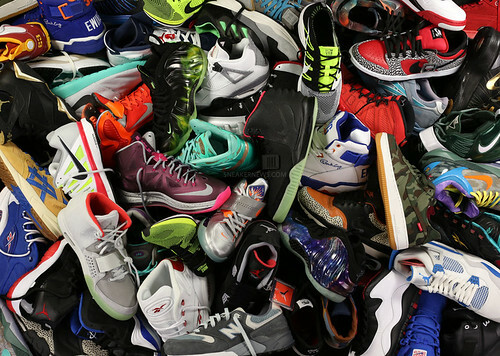 Within the last 12 months, sneaker culture has taken on a life of its own. It went from being an underground love and appreciation for athletic shoes, to a pop culture phenomenon. Current sneaker culture can be separated into two groups. On the one hand, you have those with a rooted interest in the history, design, and love for where kicks were, where they are, and where they are going. On the other are those simply looking to monetize the popularity of this new aspect of pop culture. Aficionados have their own personal tastes and reasoning for their collections. Maybe it starts with what their favourite player wore. It could be a love for the design elements of the shoe. Some may be heavily interested in the technology. Every person has their own loves, likes, and dislikes. Shoes are also seen as a form of personal expression. The different models, styles, and colourways allow the wearer to put a unique (and comfortable) stamp on their outfit for the day or occasion. Christmas 2011 saw the re-release of the beloved Air Jordan XI ‘Concord’, popular because this was the first shoe that Michael Jordan wore upon his return to the NBA from retirement. It was a technological innovation for a shoe which also utilized luxurious elements for added value. The shoe saw overnight lineups, fisticuffs, and websites crashing from fervent demand. This would be just the start of what was a banner year for sneaker popularity. The release of the Nike Air Foamposite One ‘Galaxy’ during the NBA All-Star weekend in February resulted in malls being shut down and police being called in for crowd control. The Nike Air Yeezy 2 was the second collaboration project between Nike and hip-hop superstar Kanye West. With two colourways, limited availability, and only available by RSVP, the shoe instantly saw resale prices 9-10x their original MSRP of $245 US. Retro releases of old favourites like the Concords have played a large factor in why sneakers are as popular as they are. A generation of people who used to love those shoes but couldn’t afford them, now can. At the same time, you’re seeing a younger generation of entrepreneurs seeing the financial windfall of reselling a shoe with finite availability. Whether you love to rock ‘em, stock ‘em, or resell ‘em, sneakers have seen huge growth in popularity in 2012. And 2013 shows no signs of slowing down either. Michael Jordan will be getting a senior's discount at Denny's but people will still be lining up to buy his shoes. At that point, I'll bet they're velcro. Does anyone else collect sneakers? Regarding sneakers....I think Ryan Gosling summed it up nicely in the movie Crazy, Stupid, Love. My Scottish roots compels me to wear them until they cannot be worn no more. I guess just like hockey cards or baseball caps, it can be a compulsion. I've worn the same "running shoes" for 3 years & still in great shape. Great clip and so true. right on. People must have a lot of money to be able to buy so many pairs of running shoes. Just one pair is enough for me. Ryan, you have a problem. The first step to recovery is to admit that you have a problem. Anybody looking for year one Toronto Blue Jays running shoes. I've got 2 pairs of shoes: My everyday Nikes (which I get a new pair once a year) and my dress shoes. Never understood this phenomenon with owning tons of shoes either. How'd you wear them all? Is it really worth it to drop over $100 on a pair of sneakers if you're seldom going to wear them?